The folks at Car and Driver, a publication like Horse and Rider or Sloop and Helmsman, but for cars, recently tested out Chevrolet’s new 2019 Silverado 1500 trucks, with both the new 2.7-liter turbocharged four-cylinder and the also recently-updated 5.3-liter V8, and found, to their surprise, that the V8 actually got better gas mileage than the engine almost half its size. This just shows that sometimes a smaller engine working harder can be thirstier than a bigger, lazier engine. 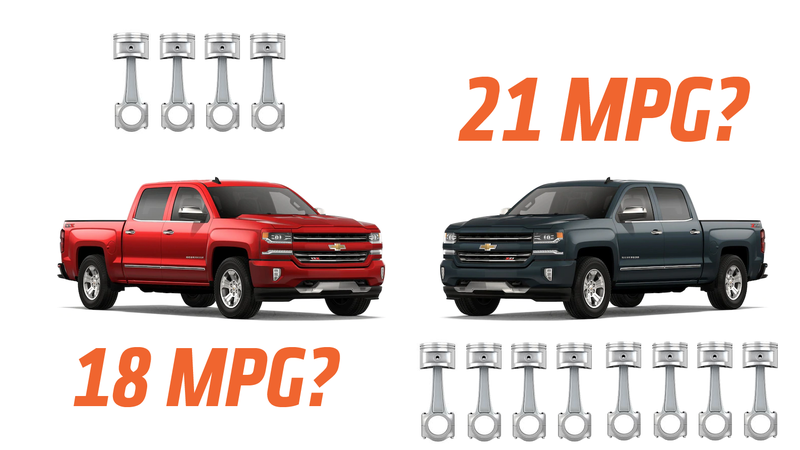 Sure, the window stickers say that the 2.7-liter Silverado (both trucks were 4x4s and had GM’s eight-speed auto) gets a combined score of 20 MPG, while the big V8 gets slightly less, 18 MPG. Car and Driver decided to run their own tests, a 75 MPH highway test run that they run often enough to give it a name: “HFE,” for “Highway Fuel Economy” test. The results were surprising: the smaller engine only managed 18 MPG over 200 miles, while the double-size V8 got 21 MPG, despite being heavier. So, what kind of sorcery is this? Part of what’s going on may be just that the smaller, turbocharged engine still has to move the same big, heavy truck through all that sweet, sweet atmosphere, and as a result simply has to work harder. Also, GM has given the V8 some advanced black magic called Dynamic Fuel Management, essentially a cylinder de-activation system that’s, you know, dynamic. It seems to be doing something that’s working here. The V8 also makes a bit more power than the 2.7-liter four, 355 to 310 horsepower. With these somewhat more real-world accurate tests showing results like this, it’s hard to think of a good argument for the smaller engine in this truck. Make sure to read the full report at Car and Driver.